(1) McGlasson resigned 1/1/1944. Members of the Texas Congress 1836-1845; Members of the Texas Legislature 1846-2004, 2005. Photo and biographical sketch. Eugene McGlasson, 32 years of age, son of John McGlasson, former Waco city attorney. "McGlasson Takes Wilson's Spot as Place Two Solon," 10/13/1940, pp. 1, 8. Waco Tribune-Herald. 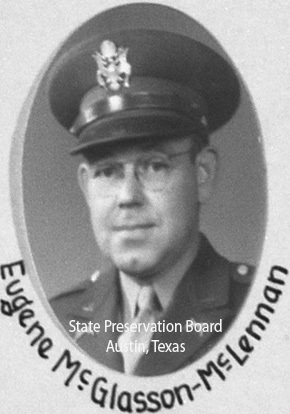 World War II service, Lieutenant D.E. McGlasson, "Legislature Faces Problem of Absences: Men in Armed Forces Can't Get Leave to Attend Sessions," 1/1/1943. Dallas Morning News. United States Army. Military grave marker, Davis Eugene McGlasson. Find a Grave. Pictured in military uniform in House composite photo from the 48th Legislature. State Preservation Board. Davis Eugene McGlasson, birth date 4/13/1908, death date 11/14/1996, interment in Rosemound Cemetery, Waco, McLennan County. Son of John William McGlasson, Sr. Find a Grave.